This week’s East Nasty of the Week would definitely be a contender for “Friendliest” and “Best Smile” if we had East Nasty superlatives. He’s a Wednesday night staple and even has his own running entourage, affectionately known as the “Ralphie Girls”. It’s my extreme pleasure to introduce your ENOW, Ralph Booker! Ralph ran the gamut of small town Tennessee when he was growing up. He was born in Columbia, TN and went to elementary school there until he was 12. His family moved to a farm in Duck River, TN in Hickman County, and he went to middle and high school in Centerville. While in high school, Ralph was quite the jock. He played basketball, sprinted for the track team for a year, and played a year of tennis. After high school, Ralph moved to the Boro and graduated with a BBA in Computer Information Systems from MTSU. Ralph retired as a Technical Sergeant (TSGT) after 21 years with the TN Air National Guard in 2013 where his military job was a photographer. Currently, Ralph works as a Programmer Analyst for the state of TN. He has worked for the state for 24 years. While Ralph is now an avid runner, this wasn’t always the case. In 2007, Ralph decided to make some healthy changes in his life. He quit smoking after 20 years and started running in 2008. 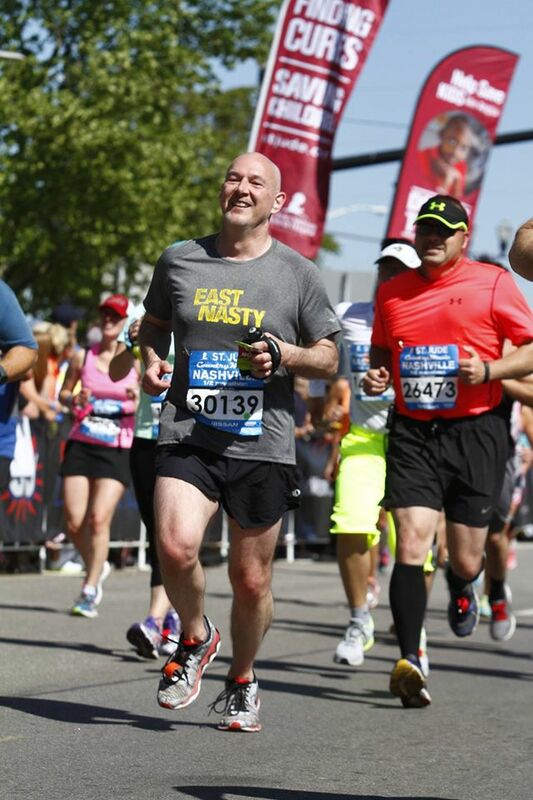 Ralph was like Forrest Gump– once he started running, he did not stop. His first half marathon was the CMM in 2009, and that would be the first of many. In fact, his most rewarding running accomplishment is having completed 11 half marathons. As for his best half marathon, that would be 2012’s CMM half. He had a super speedy time of 2:04. All of Ralph’s running medals! Speaking of the Ralphie Girls, let’s hear from two of them about our newest ENOW. Aside from running, Ralph’s hobbies are photography and traveling (and, apparently, singing a mean karaoke). However, even with all of his running accomplishments, the best moment of his life was when he became a father for the first time in October 2014 to his beautiful daughter, Annika. Congratulations, Ralph, on all of your running success, fatherhood, being loved by many, and for being this week’s ENOW! And on this Memorial Day, thank you for your service! Our newest East Nasty of the Week is an amazing teacher and runner, the wife of a rock star, and one of my best friends (or my “Boo Boo”). I’m stoked to introduce Alicia Hunker as ENOW! Alicia grew up in Dallas, Texas. As anyone who’s ever met her can imagine, she was quite the social butterfly. She was involved in every school organization, played Varsity volleyball and soccer, and ran Varsity cross country. Most importantly, she got to take classes with her best friend and husband Denton Hunker. They became best friends in 7th grade and have been inseparable since (cue the “aws”). Alicia’s killer soccer skills led her to St. Mary’s University in San Antonio. She now teaches 6th grade Algebra. While she’s always been a runner, Alicia did not voluntarily run any distance over 5k until her Junior year of college when she got injured and couldn’t play soccer for a year. She decided to run a marathon that year (2005) with Team in Training and has been hooked ever since. Alicia’s biggest running accomplishment will be completing her 6th (official) marathon. However, it’s really her 10th marathon — she has run 4 others with bibs of injured friends, because what kind of runner says no to a free race?! She’ll also be completing her first ultra-marathon (North Fork 50k) in Colorado this June. Those are definitely some killer accomplishments! Alicia’s currently trying to convert to trail running…no broken bones yet, so it’s working out pretty well so far! She says one of her most memorable East Nasty Experiences both involve running in the rain and were both with the lovely Beth Meadows! (I hear she’s an OK gal) The first was at a normal East Nasty run, and it was lightly sprinkling so they decided to go for it! As soon as they started running, a storm broke out. Even though they were nearly struck by lightning, it made them laugh their faces off the entire way back. PRs were definitely set for run #7 that night! 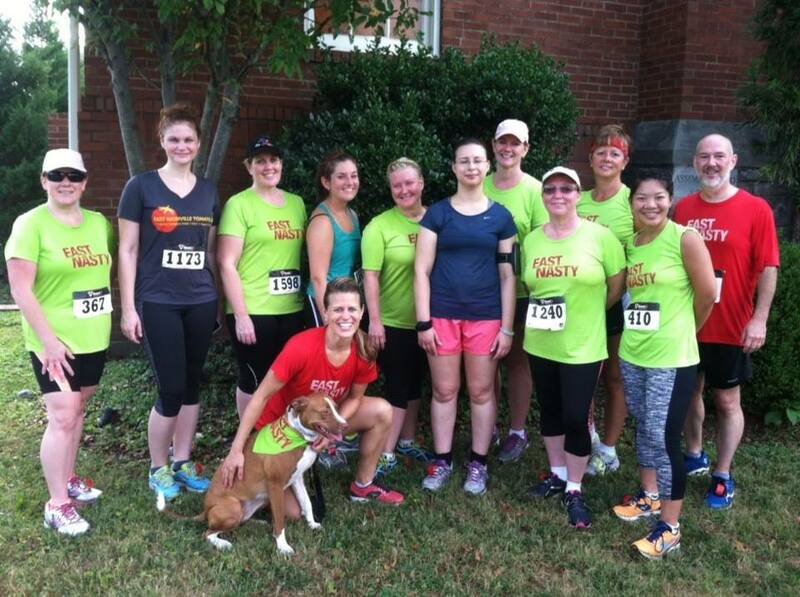 The second was Alicia’s very first race here in Nashville which she ran with Christa Poremba and Beth on July 4th 2013. A torrential downpour occurred during the entire 10k. Denton came to take pictures of everyone soaking wet and to cheer! Even better, Christa, Beth, and Alicia all placed in their age groups! 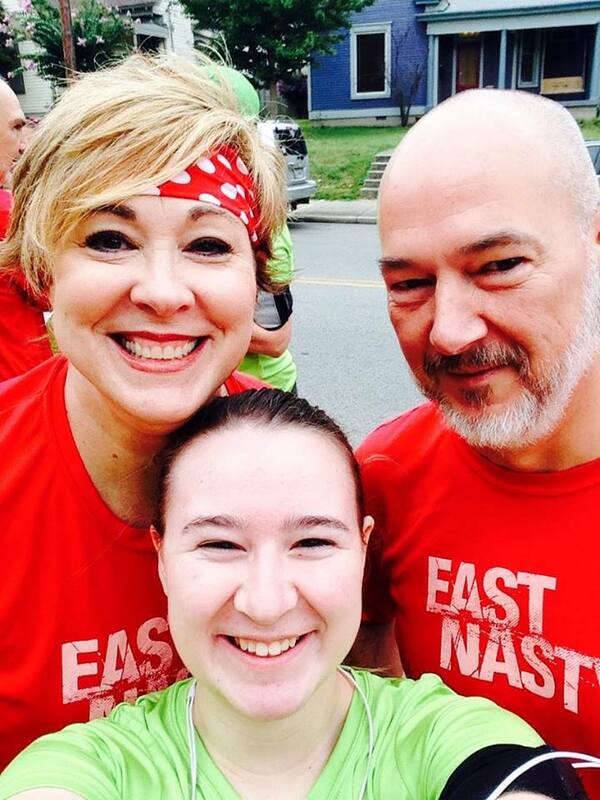 Lastly, her drummer husband, who she has been trying to get to run for all of their dating/married relationship, is an official runner thanks to all of their East Nasty friends. She never thought that would happen, and she says dreams really do come true! As for her other hobbies, she loves her dog Pickles, family dinners with her friends, foreign films, and loving people! She also loves supporting her incredibly loving and talented husband, Denton Hunker. They have been married almost 7 years and have been best friends since middle school! He is the reason they moved here, and they haven’t regretted it ever since. (#HunkerdownTN) She also loves Legos and has a Lego Engineering Club at her school. Alicia’s extremely passionate about and in love with her job. It’s her personal mission to be an advocate for educational equality. She’s lucky to get to work alongside fellow East Nasty Laura Villines at school. As I said, Alicia is one of my best friends. She is so supportive, considerate, and compassionate. From traveling over to Chattanooga to support me in a race to get well videos from her and Pickles to her every occasion cards, her thoughtfulness knows no bounds. As for her running, you couldn’t find a more dedicated and motivated runner and one who’s willing to jump into any race at any time! I’m so proud to call this week’s ENOW my friend! Congrats, Boo Boo! 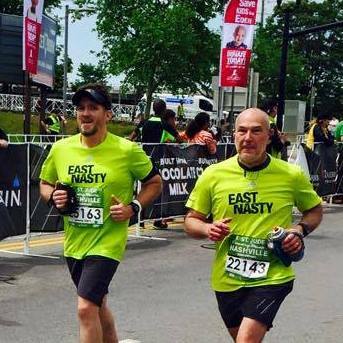 East Nasties– this week’s East Nasty of the Week is one hilarious and speedy dude, an East Nasty staple, and one half of the running power couple, Leah and Nash. Ladies and gentlemen, it’s my extreme pleasure to introduce you to the newest ENOW—Mr. Nash Harris. Nash was fortunate enough to be born and raised in the great state of Alabama. More precisely, he was born in Mobile and grew up in Bay Minette. In high school, he says he was just “an average guy” who played soccer and tennis all 4 years. Running was, by far, his least favorite part of sports (Did someone have to run laps for goofing off?). His parents still can’t believe that Nash devotes such a large amount of time to running these days. As for when he started running, that didn’t happen until 2009. He clearly remembers being so self-conscious that he would only run either late at night or really early in the morning. 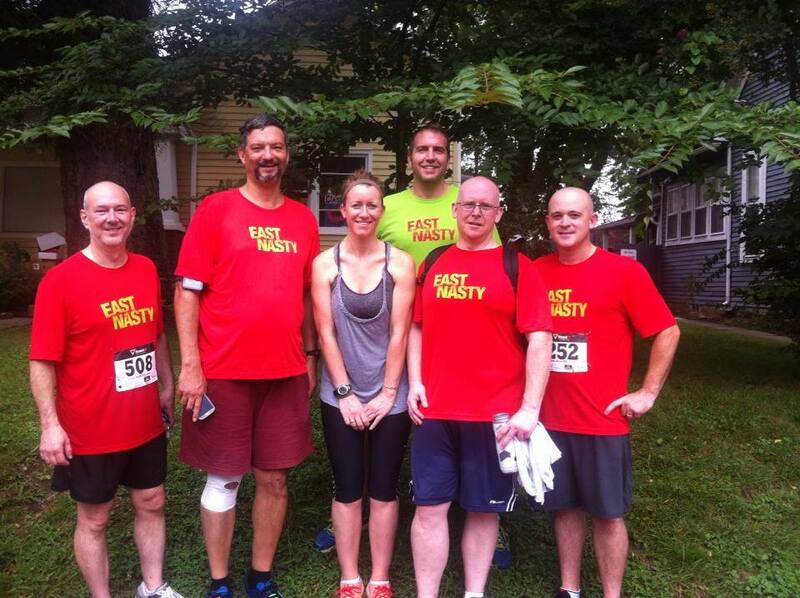 His first race was the Tomato Fest 5k which he ran in a little over 30 minutes—a time that made him extremely happy back then. After that, he started taking running more seriously and trained for a half marathon, etc. Now, a normal week for him is around 40-50 miles, races twice a month when the weather is nice, and is lightning fast (My words, not his. He’s also very humble). Nash’s biggest accomplishment in running has to be the network of friends he’s made over the past couple of years. To him, the only thing better than winning a race is knowing that there is always someone willing to trudge a long race out with you no matter the time or condition. Fortunately for us, he heard about East Nasty through his good buddy Seth Neumann. Nash’s running really turned a big corner after meeting him (and Alex Payne) and running with East Nasty on a regular basis. What a perfect embodiment of the East Nasty spirit!! Congratulations on being ENOW, Nash! You are currently browsing the archives for the East Nasty of the Week category.